So on Saturday I headed out to Coney Island with a friend of mine on a whim. I've never been to Coney Island before. (Sorry I don't have pics to go along with this happening. I forget stuff when I'm whimming). Anyway, Coney Island was sort of what I expected. Sorta seedy. Fun, dated, funny rides. Nathan's Hot dogs. Rickety boardwalk. Cheaty carnival games. Timewarpinity. Impressively unique and human. And carnival barkers calling people into certain attractions, or tempting you to play the water pistol game to win a stuffed Nemo, or the scary ride haunted ride or whatever. But one 'attraction' really stood out. It was a thing called, 'Shoot the Freak'. Nice. 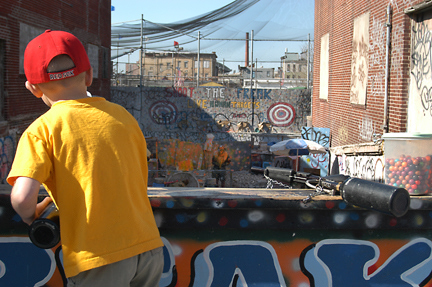 Basically you can pay a couple of bucks and get to shoot paintballs at a "Real Live Human" (aka 'Freak'). I didn't participate in shooting the freak but I watched it. Some guy paid $2 and got ready with his paintball gun. Then the freak emerged. The 'freak' was just some very bored looking regular dude who was dressed like a baseball catcher. Before the shooting started he lifted his mask to his forehead and spit a huge loogie. Then he put his mask back down. The shooter opened fire. The freak bobbed and weaved. The shooter kept shooting paintballs. The shooter hit the freak in the leg. Then he put down his gun and walked away. The freak walked off and waited out back until the next shooter stepped right up. 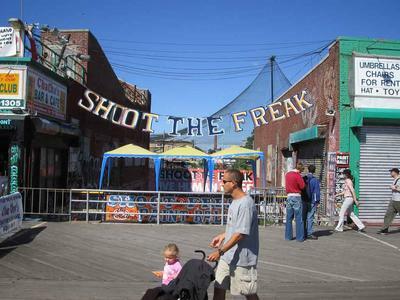 There's no prize if you shoot the freak. Nothing happens if you miss. You just get to take pop shots at the freak. That's it. Whenever there's no shooter, the barker goes back on his loop to try and get someone to shoot. Would you rather work as the barker or the Freak?